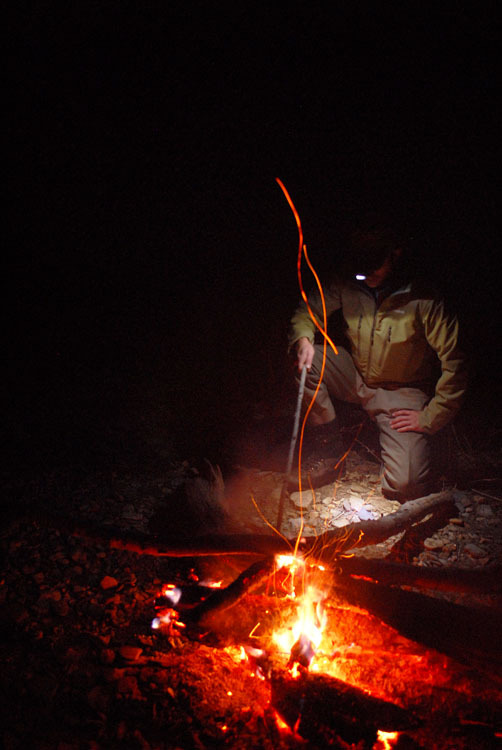 THE FIRE CRACKLED and threw shadows against the opposite bank as I methodically shot fly line into the dark water. With only myself for company, I focused on fishing. Strip. Strip. Pick it up, cast again. Strip. Strip. Nothing. Take a step to my right. Like a steelhead angler in the Pacific Northwest, I worked my way down the gravel bar, blind casting a huge streamer and covering every speck of water. To no avail. It was October 2008, but a freak Indian Summer warm front had slid across Kentucky, dragging the isolated, rolling hills surrounding the Cumberland River near Burkesville right back into August. The rest of the party were already back at the fire, which we had built out of driftwood on a dry shoal mid-river, roasting hot dogs and s’mores. In another two hours we would give up and—using the fire like a lighthouse—slowly ease the boat back to the ramp. Two weeks later our friends would crow over the fine fishing they had, once the weather turned. Your typical October on the Cumberland used to be nothing short of a bonanza. For years, the huge depths of Lake Cumberland behind Wolf Creek Dam provided ample coldwater releases to feed and grow extremely outsize brown and rainbow trout. Then, in 2005, anglers and area residents suddenly got a shock: Wolf Creek Dam might fail, the newsmen said. There were holes in the bedrock, made of a spongy limestone called “karst.” Nashville might be blown away. Like most news stories, this one was a paper tiger. The Dam needed work, but the Army Corps of Engineers already had the situation well in hand. Beginning in 2006, they started to draw down the Lake, ultimately lowering its surface down to 680 feet above sea level – a “ceiling” that managers must hold until work on the Dam is complete in 2012 or 20131. The Cumberland is blessed by the foresight of Wolf Creek Dam’s engineers. They may have missed the squishy bedrock, but they knew how to grow trout. Sluice gates at Wolf Creek (the pipes through the dam that go around the generators, usually used for flood control) were located at the bottom, 120 feet down, rather than the top of the structure. This means sluiced water on the Cumberland is cold—colder even than generated water pumped through the turbines—unlike most other hydroelectric dams in the southeast. Since 2007, the Cumberland below Wolf Creek has been a minimum flow advocate’s best case scenario. While the overall length of the coldwater fishery able to support trout has diminished with decreased flows, many of the largest trout have now been concentrated in half as many miles of river. 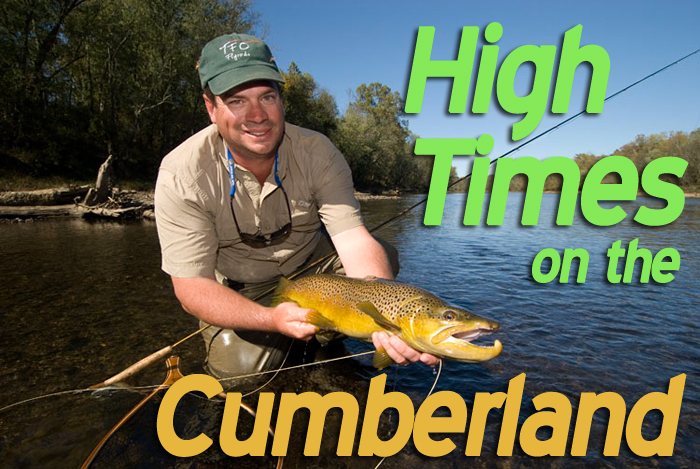 Large brown trout used to be the rule on the Cumberland. In a normal year—even a “normal” year since the Dam went offline—fishing in October on the Cumberland is expected to be exceptional. The reason is simple: all those huge browns start hearing the dulcet tones of Barry White all at once. In other words, they get it on. In order to best understand how to fish during the brown trout spawn, you need to know a bit about trout reproduction. When the sun reaches a certain point in its yearly orbit, or when the leaves turn, or the air grows crisp, or the kids break out the football jerseys (no one’s really sure what actually triggers the event), the brown trout start to make their way onto the shoals (or “bars”). Usually browns start staging in the Cumberland by mid-September. At some predetermined but unknowable signal, the first females (or “hens”) will begin to cut redds (which is what biologists call their nests). They swim onto the shallow shoals and pick out a suitable patch of typically pea-sized gravel. They turn broadside and fan the bottom with their tails. A small mound of rocks is piled up. Over time, and many repetitions, the hen will cut herself a sizable nest. These scours are a yellowish-orange color on the Cumberland. After the hen has built her bed, she will take up a position on top of the scour and await her mate. Different males, typically smaller, will vie with each other for the chance to “milt” or fertilize her eggs. When the time comes, usually in the first weeks of October, the male will swim in front of the female, release a cloud of white milt, and, if all goes well, create some baby trout. Unfortunately, on the Cumberland, all does not go well. Biologists working for the Kentucky Department of Fish and Wildlife Resources confirm that water releases have always wiped out the redds before baby trout could survive. In 2007 and 2008, the hope was that low flows might allow actual reproduction, but surveys failed to find baby trout despite work on the Dam. Thus, unless something changes, these fish are mostly just going through the motions. Still, trout eggs are wonderful sources of protein and nutrients. Consequently, during the spawn, just about every fish in the river will key in on this food source (unless it’s actively spawning itself). And not just brown trout, either. Rainbows are voracious consumers of brown trout eggs; for them, the annual brown trout spawn is an invitation to belly up to the buffet. Below every established brown trout redd, you will find a small cluster of rainbows—some of them very large—chowing down on their cousins’ eggs. You’d think catching a large brown trout sitting motionless in shallow, clear water, actively feeding on eggs, would be pretty easy, right? In fact, it isn’t. Fly fishermen typically use 6X tippet (about 2 lb. test) at an absolute maximum when trying to fool these fish. Years of targeting by anglers bent on the same thing have taught the trout the difference between an artificial egg and its natural equivalent. A dead drift is absolutely crucial, as is a stealthy presentation. The shadow of a nearby angler will give almost any trout lockjaw; and those big browns and rainbows didn’t get that way by being stupid. In fact, with a few exceptions early in the spawning season, trout on redds are little more than Tantalus’s fruit—always just out of reach. They’re right there. They’re obviously feeding. And they are not eating what you’re offering. It’s a stacked deck; shallow, clear water, paranoid trout, and bright sunshine ultimately give more ways for the trout to evade you than you have tools to trick them. You’re a lot better off focusing on the fish that are not so obvious: the non-spawners. A comfortable fish is much less wary than one which knows it is completely exposed. Fortunately, you’re in luck. With few exceptions, most of the biggest trout seem to spawn at night and lie low in the day, eating and storing up energy for their nightly exertions. On the Cumberland, the typical spawning shoal will have a shallow side and a deep side. In the shallow water, nearest the exposed gravel bars, the trout will build their scours. Meanwhile, during the day, the big resting fish will hold and feed in the deeper water on the opposite side of the river. Oftentimes that deeper water will have some form of obstruction, like an old log lying submerged underwater. Chances are very good that log will hold trout, usually on the deeper side in more than six feet of water. Rigging for these fish is not especially complicated, but there are some tricks. You will probably need 6X tippet for fly fishers, or four-pound test for spin anglers; after all, it’s better to hook and lose a fish than to hook nothing at all. Typically, fly anglers use nine to twelve foot leaders with a float (a Palsa-brand stick-on, or even a small balloon tied on with a half hitch loop) near the base of the leader. 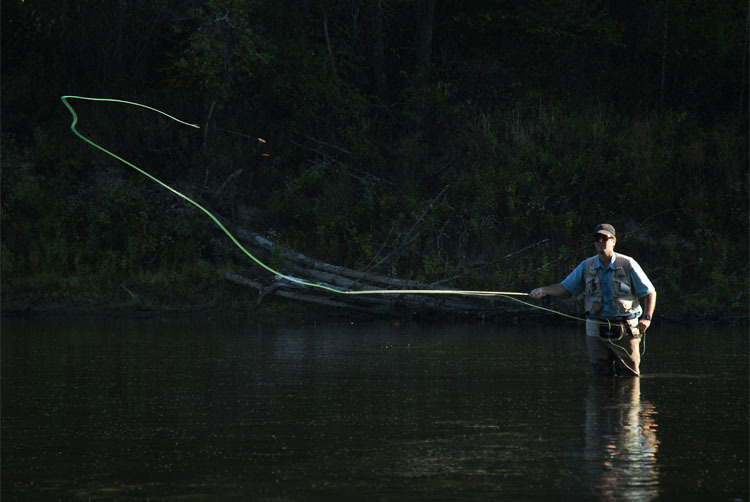 Nine-foot fly rods are standard but if you have a longer ten or twelve-foot model, bring it. Big cross-river mends (necessary for a good dead drift) are easier with longer rods. Meanwhile, spin anglers can rig up the same system: just put a bobber or balloon on six feet from the end of the line, and crimp a split shot a couple feet above a salmon egg (or even a fly). This split shot or some weight near the fly or egg is absolutely critical (usually eighteen inches is close enough). The weight will draw the fly (or egg) to the bottom, while the eighteen remaining inches of tippet will keep the bait dead-drifting right at the trout’s level. Especially on bright days, browns have a tendency to hold close to the bottom and “filter feed” on whatever comes by. You can tell if a brown is feeding by watching for a small white flash—the opening and closing of his mouth. You’ll need to cast close and get a good drift, because these fish aren’t going to move more than a couple inches to eat a passing bait. Lots of very successful fly anglers use two flies; the first, nearest the line, should be an egg pattern. Even if a trout refuses your egg pattern, it will rarely ignore it. Every egg is such a protein boost that they’re all worth checking out. The dropper fly is often more critical. Go with something small, like a midge or a Pheasant Tailor or a tiny scud like a Wilson’s Trout Crack (spin anglers can also use flies for a dropper). Size 18 hooks are about right. Many trout will slide over to inspect an egg, then, having refused it, will lackadaisically swat the dropper. It’s as if they think they’re safe after spotting the first fake. Knots for tiny flies are important, too. If you tie a size 20 midge on with a Clinch knot, you might inadvertently double the overall size of the fly. Instead, use a “Davy knot,” a much smaller and very fast knot with good strength when tied correctly. You can look up instructions on the internet. Knoxville angler Caesar Stair searches the drink. The outlook on the Cumberland going forward is fair-to-moderate at best. 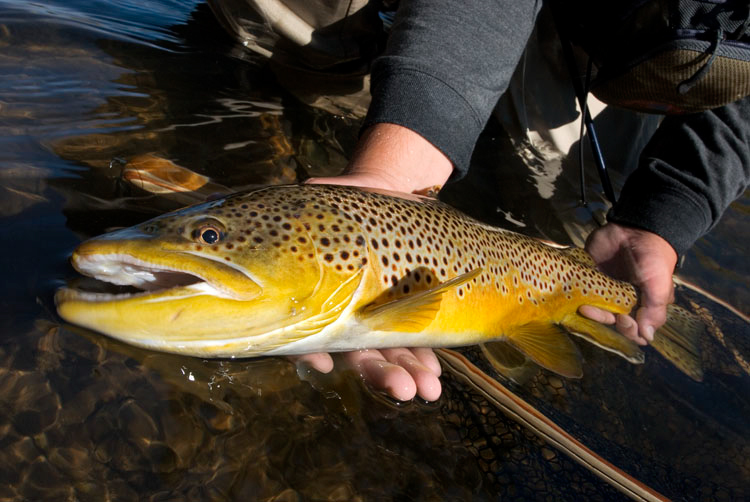 Successive years of drought and hot weather have definitely taken a toll on the brown trout. Despite the Corps’ best effort, there have been some unavoidable periods of warm water and low flows. While no one has reported seeing any large fish kills, anecdotal stories of stripers slaughtering trout upstream of Rainbow Run suggest that the fishery is facing some challenges. Further, the drought may have been a blessing in disguise, because it let the Corps keep the water levels in the lake relatively low without much generation. With heavy rains, the Dam must generate, meaning water must leave the Lake before it has time to settle to groundwater temperatures of 52 degrees or so. That puts more warm water in the tailwater and thus more stress on the trout. The best thing anglers can do in this time of stress is to practice quick catch-and-release and remain good stewards of the river. If you see an angler killing a big fish, or even stressing it with a hard fight before being released, be polite about it, but ask him to consider what he’s doing. The Cumberland’s not going to be the trout factory it once was until the dam is repaired; in the mean time, we are casting to fish which developed in the good years. For every one we lose, we’re back to square one until at least 2012 (when the Dam is scheduled to return to regular generation, barring setbacks). At the same time, I’m a firm believer that only those who are invested in a river will bother to protect it. The Cumberland should be fished. It should be enjoyed. Take advantage of these low water years to fish spots you may not see on dry land again in your lifetime. It’s a great resource, but resources are meant to be used. Only by engaging with the river can we hope to teach the anglers of tomorrow what a special thing they have, so that when the time comes, they too will want to preserve it. This article originally ran in the November 2009 issue of Kentucky Afield magazine. 1 As of January 2014, work on the Wolf Creek Dam repair project is nearing completion and lake levels are expected to return to normal by Summer 2014.